Barack Obama did it. LK Advani is doing it. 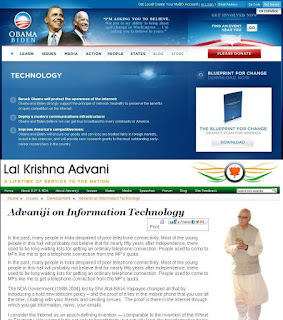 BJP's Prime Ministerial candidate for Indian Elections 2009, LK Advani is following Barack Obama's footsteps.He has a website, a blog, a mega budget adwords campaign and he is doing social networking to target the youth of India. But, why am I discussing politics on this presentations blog? LK Advani's website has 3 lessons for presenters. The landing page is clear and simple. The candidate's image is followed by a small introductory write up. The candidate greets you with a recorded audio speech grabbing complete attention. He delivers his two minute speech to his target audience well. Scope for improvement: A video would have done a better job. The Home page is a damper after a good start. The lessons from Obama's website have not been taken at all. One needs to reduce clutter & club similar information (be more organised). There are 29 items on LK Advani's home page which fight for your attention. His various public speeches could have been clubbed under one head. You (the voter; the audience) would like to know what Obama thinks on Technology. In 3 bullet points, Obama gets his views across. On the other hand, Advani talks in a 292 word essay. He might have a stronger argument but will still lose to Obama, if they were fighting for the same post. So, start well, avoid information overload and be clear to win your audience's vote! Do you have more lessons to share? Priministrial Candidate LK Advani,really a visionary,strong person in Indian politics.He has definate vision & firm principals to make India strong,economically world leader.His comprasion with OBAMA of U.S.A.fefinately a true scene for Indian politics. I would suggest that we limit ourselves to Advani website and not comment on Advani personality. That we can do in various election related blogs. thanks for good comparison, trust you have shared your feedback with Advani website managers. This way your inputs will really be useful to the person concerned. I will be sharing my observations with the web site designers. Politics always evokes a strong response from people. It should also. But this blog is not a political one. I have reviewed Advani's website to cull out learnings for people who make presentations. Expect people not to leave political comments here. Thanks. Hey Guys, thanks for your observation. 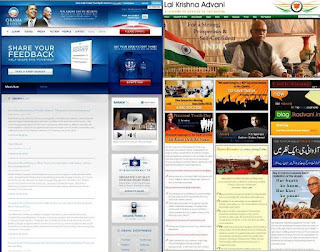 Website team of lkadvani.in has taken note of your suggestions. They appreciate your suggestions and promise to improvise. Soon ! Hope my tips were helpful. Do share the changes once made.